5 July 2017: Seed companies in Mbeya, Tanzania, have reported increased sales ranging from 20-90% following an UPTAKE campaign that promoted the use of improved maize seed varieties last season. 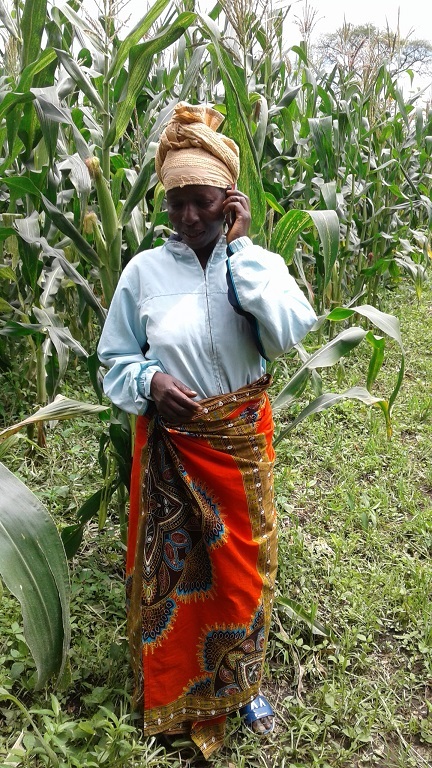 The UPTAKE project has been using SMS technology to promote the use of improved seed varieties to 40,000 farmers in Tanzania’s Southern Highlands, as part of a maize campaign. CABI is working in partnership with the AGRA-funded Scaling Seeds Technologies Partnership (SSTP), an intervention with the objective of accelerating smallholder farmer’s access to transformative agricultural technologies. The UPTAKE SMS campaign shared messages that could increase maize production and mitigate post-harvest losses. Alongside the increased use of improved seed, farmers also reported new knowledge disseminated through the campaign which had changed behaviour in other areas. Alphonse Malowe, a lead farmer from Bonde la Songwe Village in Mbeya Region, says: “farmers to whom I have forwarded these messages tell me that previously they only applied ash to manage pests. They did not know how to spray maize and the SMS have prompted questions regarding suitable pesticides, when and how to apply them.” His views are supported by farmers in Njerenje Village also in Mbeya, who say they thought pesticide use was limited to beans and were unaware that they could be used for maize too. The Agricultural Research Institute Uyole, which collaborates with seed companies in the SSTP intervention, also reported increased sale of early generationseed to the companies after the campaign. The maize companies purchase this for bulking and increased their demand, in anticipation of a subsequent phase of the campaign. Alinane noted that improved seed should be planted within the context of good agricultural practices if the maximum yield is to be realized for a variety. He continued: “GAP messages are very important to complement the use of improved seed. If you use improved Uyole hybrid varieties and expect 30 bags per acre without other good agricultural practices, it won’t happen. If you do not weed, you will lose at least 30% of your production, hence the importance of the SMS messages disseminated alongside the promotion of improved seed varieties. We also complement the campaign with our fliers on the importance of timely land preparation and planting, appropriate spacing, correct fertilizer application amongst other practices. The SMS campaign was conducted in rural Tanzania by the Upscaling Agricultural Technologies through Knowledge and Extension (UPTAKE) project. UPTAKE uses interactive information and communication technologies to enhance agricultural extension messages reaching small-scale farmers. These technologies can include radio, interactive voice response (IVR) and short messaging service (SMS) are delivered in clearly defined geographic areas, such as the area reach by a radio station. Within the UPTAKE project CABI implements the mobile telephony component of the campaigns, in this case using SMSs. Farm Radio International leads on all aspects of radio communication. UPTAKE is funded IFAD to contribute to enabling rural poor people to improve their food security and nutrition, raise their incomes, and strengthen their resilience.